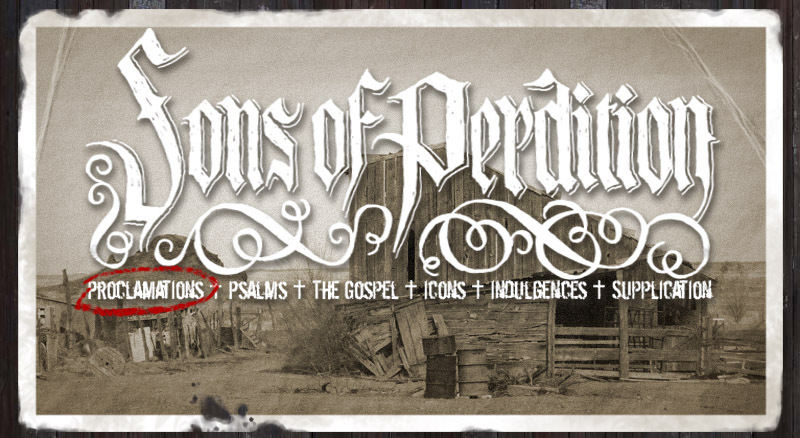 O Hosanna, the new Sons of Perdition album is finally here! Proclaimations -> O Hosanna, the new Sons of Perdition album is finally here! After slaving away for an incalculable number of hours/days/weeks/months/years, I'm finally releasing "Psalms for the Spiritually Dead". It's only available as a download because I'm giving up the material trappings of this world in my ongoing quest to become an esoteric adept. For now, anyways, it won't exist in corporeal form. The release of the album coincides with a thorough revamp of www.SonsOfPerdition.com, wherein I updated a lot of content and added a shopping cart that allows me to sell you music for a lot cheaper. Thank the good LORD and Seth Fleming for collaborating on it. The new site also lets me give you exclusive free tracks and anything else I feel fit to hand over. You just have to create an account on the site, which is free and secure. If you already have an account, just log in and click on "My Account" over on the right under "Options". This free track, "O Daughter of Babylon", is listed under "Free MP3s". Aside from dimming your day, this free song lets you see how the new shopping cart works without feeling like you're gambling your soul away. If you listen to the ghastly croak of your conscience and buy the full album of "Psalms for the Spiritually Dead", you also get a PDF of lyrics and photos that will make the most hard-hearted of men weep and rend their clothes. It comes automatically with the download. The whole shebang is available for the holy low price of $7.77, because Jesus just wouldn't let me charge anything more for a ticket down that road of ruin. I implore you to take a few minutes to poke around the new site. Shine a candle in every corner and peer intently into every inky shadow. Hell, get the new album or even just the free song while you're there. Let this new music hide the lowly sound of your tears as they soak into the dusty floorboards. Best dirges unleashed upon us mere mortals in many a moon.